A few weeks ago, I received a set of Sena SMH10 Bluetooth Headsets and a a SM10 Dual Stream Bluetooth Stereo Transmitter to use and review. Preliminary long story short? I am LOVING using the headsets! I have never used any type of helmet communicator before. Frankly, I wasn’t really sure if it was something that I really wanted. I was skeptical. As I thought about it, because the SMH10 does so much more than allowing me to talk to another motorcyclist riding along with me – I figured, what the hell? I’ll give it a try. The headsets can pair to several devices at once – other Sena headsets for bike to bike communication, your GPS, your phone – it’s all pretty awesome. Now, I don’t really recommend riding and talking on the phone – but, it is possible. Being able to bluetooth to my iPhone and GPS has been great. I put this combo to good use during the Void Rally. Having turn by turn directions pause the music and whisper sweet turn lefts in my ear was incredibly helpful. It was also during the rally that I discovered that the lady who lives inside my GPS seems to have a little bit of an attitude problem when it comes to recalculating,… but that is a story for another day. 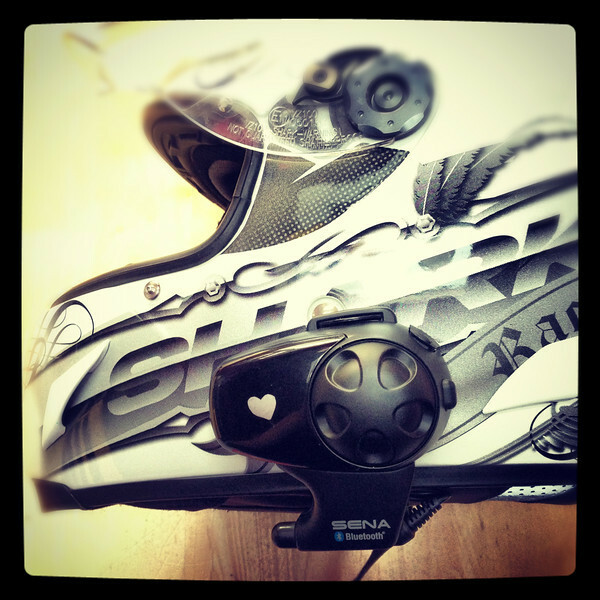 Initially I wasnt sure how well I would be able to hear through the helmet speakers because I ride with earplugs in. It was a pleasant surprise to find that I was able to hear my music and the GPS, even with the deafening buffeting coming off of my Tiger’s windscreen at highway speeds. Now that I have the Ural, being able to freely talk with my sidecar monkey has been a big help. Actually hearing, “Mom, I need to pee” works much better than taking my eyes off the road to try to figure out what the gesturing beside me means. Being that there is only a glove-friendly jog wheel and a single button, you don’t get get confused about what you’re supposed to press or turn. I find it to be totally intuitive to use even when you’re concentrating on you know, riding. Battery life has been great. I’m not actually sure how long the battery lasts because I haven’t had it go flat from full charge on a single day’s ride. I had no trouble with the device riding 500 miles in the pouring rain from Virginia to Long Island. It worked like a champ. Pairing the headset to my Zumo 660, my iPhone, and another headset is straightforward – a piece o’cake. I’m so happy with the SMH10. It’s is greatest thing I didn’t even know I wanted! Now I can’t imagine riding without it. I will update this post with any other findings during our travels together. Stay tuned for a post on the SM10 Transmitter. Review Disclaimer: I did receive these products complimentary. This will in no way influence my opinion on the product. That would be crap. A few fellow riders have recently inquired about headsets, and I have turned them to the only set I am familiar with, but this headset sounds like it offers more than my Scala G4 Powerset. Curiously, any information on the range between two riders? Or price? Thanks for the review. Love your blog. We did a test with the range over the weekend. Unfortunately we were in a wooded area so I think that might’ve diminish the results. The materials say: 900 meters in open range. e’re gonna to test it again in an open area and see when it cuts out. With a quick look ’round the web it looks like the single unit is in the neighborhood of $160ish dollars and the 2 pack around $300. Thanks for the review, I am currently looking for a headset. This is a big help! We have had our Senas for a few months now and are really enjoying them. We usually ride in the open mic mode instead of the push to talk. Every once in a while you can hear the other person hiccup, burp, swear, etc and it is quite amusing. We don’t have smart phones or have them hooked up to the gps, but they work great for us for just communicating. I am glad you are enjoying them too. Sena seemed to get it right with this set. She probably wouldn’t enjoy my singing and should never hear my “helpful” driving tips for other people on the road. Thank you for the review. I have been considering these for a while and with all the positive reviews, I’ll probably consider picking one up about the time that they are discontinued. We have had our SMH10’s a for a few months now and it came on a 2000km holiday with us without an issue, we love it! Nice to see what else can be done with it though, we only use it for bike-bike on open mic, as Brandy said you get random things from the other person, the oomph from up ahead is a good warning of a big bump coming up (invaluable for that alone!). I’m really blown away by the Senas. I love listening to music while we ride, and I must have the strangest shaped inner ear on the planet because I can’t find a single set of inner ear headphones that actually work or stay in my ear when I put on my helmet. It’s usually a three or four attempt ordeal with my anger level raising on each attempt. I gave up on music. Until the Sena. The speakers are great – you don’t feel them, as they are small in depth, they are plenty loud and I can hear them without issue while wearing earplugs, and having a hook-in to Siri where I can say “play x playlist”, “shuffle music” or “play x song” is so awesome – so much better than trying to screw round with the phone while riding. Its all so easy and intuitive – switching between different intercoms while riding, three-waying with Fuzzy and the little one, switching back to music, all so easy. Coming from an old crappy chatterbox years go that flat out stunk, these are like a whole new world. Really recommend em. It’s great you found something you like. The Sena’s have fabulous reviews. I have no riding buddy but I have a helmet BT unit as I like to listen to the traffic reports, and it does connect to my iPhone. The Sena units are fab. We’ve used Scala Rider also and they work fine, but the Sena is much easier to manage. The audio is also louder. My wife now refuses to ride with me unless we have the intercoms fired up. I was debating getting one of these..my friend brought it up but at the time I was skeptical since I tried riding with earbuds and they hurt my ear canals. These cost a lot but I might just have to take the plunge!! Thanks for the review! I love the optimistic review, but Sena SMH 10 w/ 4.1.1 upgrade hasn’t been as kind to me. My iPhone 4s w/Siri is aggravatingly non-functional. What magic makes it work for you? I’m really sorry to hear that, Bob. What sort of troubles are you having with Siri? 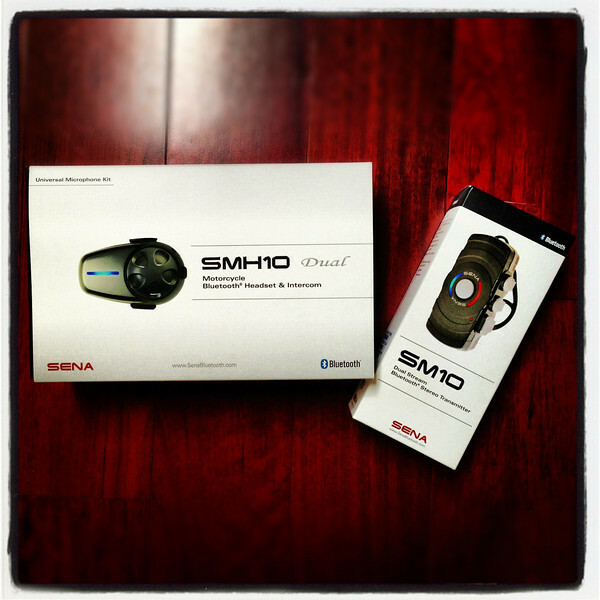 Your review of the SENA SMH10 has prompted me to order the SMH10R (slim version). Still using yours and it’s working well? I’m excited to try mine once it arrives.